In this tutorial we will show you how to do a Full cPanel Backup of your account. Backing up your website is a necessary step for all users. Before making any changes to your website, it's best practice to always create a backup. 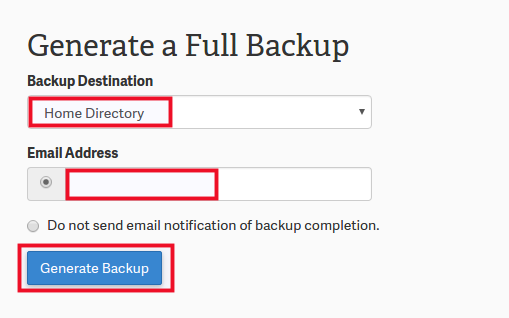 Cpanel has a built-in backup tool to assist you with creating backups. This handy utility will create a zip file (compressed file) that you then can download to your local computer for storage. Please be advised, we do not allow anyone to store backups in File Manager, you must store them off of the server. Creating a full backup ensures you back up everything and is the safest method to ensure all your website files and emails are safe. We recommend that all of our customers maintain their own backups. Be sure to read our Do you run backups of your servers? article for an overview of how backups are maintained for our servers. Want more users? Check out our Reseller Hosting plans which includes WHM access to create additional cPanel users. 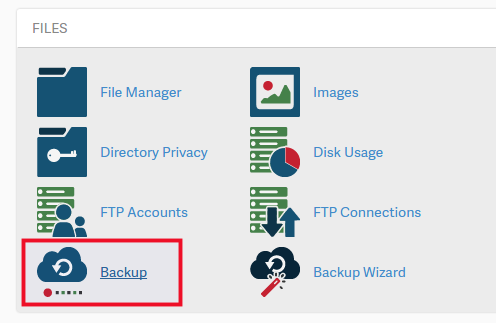 Click the Backup button in the Files section of cPanel. In the Full Backup section, click the Download a Full Website Backup button. On the next screen make sure the Home Directory option is selected. If you want an email notification when the backup completes, enter your email address. If you do not want an email, check the box next to Do not send email notification of backup completion. Click the Generate Backup buton to begin the Full cPanel Backup. Congratulations, now you know how to perform a Full cPanel backup! We also have walk-through guide on backing up your website files, and backing up a database in cPanel. How do I remove the full backup from my InMotion server? I've already downloaded it to a safe place. I just want to remove it so it doesn't take up so much space on my server. The easiest way would be to use the cPanel File Manager, but you can use FTP as well. If you mean restoring the backup, you can uncompress the cPanel file or submit a data restoration request via AMP. If you request a DRR, you'll want to add all details regarding your request. Is there a way that I can automate a full backup to store locally with a script? If you have root access you can configure backups in WHM. You can run a script regularly with a cron job. But, we recommend storing your backups in a different location, such as on your local computer. Hey Do the full website backup includes all the databases files ....Do the database need to be backed up separately or the full website includes those files in it...If yes where is the file located in backup folder????? Yes, the cPanel Full Backup does include the databases. They will be located in the "mysql" folder in the compressed backup file. How can I restore the backup? Restoring the full backup in a shared hosting plan requires help from our Live Support team. In VPS/Dedicated hosting, we still recommend help from Support, but there are cPanel scripts that you can run. "You can use this file to move your account to another server or to keep a local copy of your files." can someone please explain this? what to do after backup is performed? The complete cPanel backup file is a copy of all your website files and databases . If you ever have to move to another hosting service, then you would be able to use that backup to move your website as long as the new location is using the cPanel system. A backup is insurance so that in case anything happens to your site, you can recover your site. You should ALWAYS have a backup of your site and not one produced by the automatic systems provided with the host. If you have your own backup, then if something happens to the server, then you will always be able to recover your website and prevent the headaches of having to rebuild your website if you didn't have a backup. If you are on a VPS you can store the backup. If you are on shared, you should delete whenever you no longer need it. It's advisable to store backups in an offsite location, just in case there's physical damage to the drives. I have a GoDaddy hosting account that has multiple (13) domains mapped to sub-folders with 13 separate Wordpress installs. I want to migrate all 13 Wordpress installs to my new InMotion hosting account. Is there any changes to the procedure you have outlined here? Website transfers are handled on a case-by-case basis. You can see the requirements fo requesting a transfer here: How to Request a website transfer in the Account Management Panel (AMP). If I Download a Full Website Backup by Performing a Full Backup in cPanel from my home directory, then later need to restore. What happens to email that arrived in the interim between the backup and restore period?? Anything that arrives after the backup has ran will no longer exist once the backup is restored. please guys help me out how can i recover public_html files ... mistakenly it has been deleted from trash as well ... i cann't restore from trash please help me out .. I suggest contacting support to see if we can restore them or if there's a backup available. I must have misunderstood. I thought you recommended scanning it with my PC antivirus before uploading it to your server? You can certainly scan these files, but it is unlikely to catch most of what may be considered malicious in a web hosting context. I have more problems. The shared server I am on apparently has a misconfiguration of root admin and mod_userdir protection is disabled, which lets users access their sites through other sites on the same shared host. This was what was indicated on the Google Webmaster Central Help Forum. Unfortunately, I included the Google post on my ticket about the hacking, along with the cPanel documentation link for it, but they have never responded in over 2 weeks. I thought I had gotten all the hacks off, but this morning I found another one in the logs, so I now have /~migps in my public_html (I had similar /~user/ ones before. I have even signed on with SSH/PuTTY, but I still cannot "see" them using ll. I really don't know what to do (other than change my cPanel password yet again, which I did immediately). Do you have any suggestions? We desperately want to get off Arvixe since they are allowing this and don't respond at all. Yes, mod_userdir functionality is enabled on our shared servers by default, but this is not a security issue, as this only allows access to files that are already publicly accessible. There is no write access to any other user's files, and no access to files that are not publicly available. We have <a href="http://www.inmotionhosting.com/support/website/hacks/recovering-from-a-hack">an article with recommendations for dealing with a hacked account</a> right here in our Support Center. Thank you, John-Paul. My Kaspersky Total Security wants to delete the entire gz archive when it finds malware, but if I just FTP'd the entire /home/user/ from Arvixe to my PC and then scanned that it would probably work. Can I delete the /home/user/tmp area? I am presuming that tmp really does mean temporary and won't affect anything? If so, I can avoid having to download that. At this point, the cPanel says it is using around 13GB, although the gz file is just over 5GB. Since that is over the 10GB, I presume I would have to FTP it anyway. I am not sure why it is so large, as my public_html area is tiny. Geckohale, please keep in mind that traditional personal computer security scanners are not intended to scan website files. Deleting the 'tmp' folder is not recommended. However, if you have files or folders inside that folder that you know you don't need, you should be safe to remove those. Mahalo, Tim. My problem is that I want to move my site from Arvixe as they are very insecure (and do not respond to help requests). I worry that there are hacker files in my "home" area, although the public_html is clean. I do not know much about the non-public files and directories, so am not sure what I might need from it, but we do want our email. I have a full backup, but I don't really want to have you folks restore it as I fear I will get any hacker garbage that might be hiding there somewhere. Do you have any suggestions on how I could move stuff (presuming I knew what actually needed to be moved to get all the mail)? The "home" directory backup should include your email, as well as any files. The only thing it will not include is your databases. You could try scanning it (with your local antivirus) before uploading it to our servers. This could help clean existing hacker files. When you do a "Home Directory" backup, what exactly is backed up? All the public_html I would expect, but what about files/dirs in home? I presume it excludes the software? It must include the /mail folders, but is anything else included? Is that sufficient to totally restore all the files for your website? Everything from /home is backed up. So anything that is in your root folder for your account is backed up. Hi, Will this backup include the database and files? Yes, the full backup includes the databases as well as the files. Even if you do a full backup in cPanel, how would you restore it? If you do a full cPanel backup and you do not have root access with a VPS or Dedicated server account, then it would require a request to the live technical support team. If you're on a business level account (shared server), any full cPanel restore can only be done by the technical support team. Does taht operation get the databases as well or just the site's file system? It grabs all the databases as well. Hi, I have tried to generate my backup since june and I can´t. I have two backups of April and May but in June and July I have had'nt. What do I can do ? How large is your account? Larger accounts cannot be created by using the backup tool. You can zip the home directory files and download them and then export your databases by using the Export tab in phpmyadmin. Any way to automate a full cPanel backup? I'd rather not have to go through the GUI as part of my weekly routine and would rather have a cron job or something do it for me. Yes, it is possible with cron jobs, but it is recommended that you have an external storage area to hold the backups. FTP is used typically, and you can add your backup script to the crontab through cPanel. Christopherm, where can I find a backup script that works with inmotionhosting.com's servers? I have a PHP script that I use to automate Cpanel backups on a different host's server, but it doesn't work with inmotion's server. Maybe I missed it but it would be nice to be able to print these out to have on hand. Thank you for contacting us. You should be able to "right-click" in the browse and choose Print, or use "Ctrl + P" at the same time to bring the print menu up.